The Pentek PBH-410-1-5 is designed to minimize down time during changeouts, keeping your fluid stream on longer with less interruption. Its solid construction is built for reliable performance, in a lightweight and corrosion-resistant enclosure. This housing accepts a wide variety of standard 4-inch x 8-5/8-inch (102 mm x 210 mm) filter bags, both polypropylene and nylon media, to accommodate your specific filtering goals. The Pentek Bag Filter Housing with 1.5-inch inlet/outlet fits standard 1.5-inch water lines. 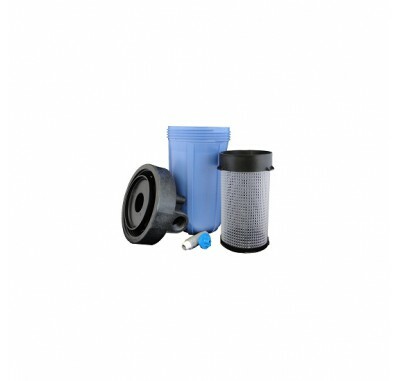 Filter basket, 0-100 PSI gauge, o-ring, and drain valve all included. Housing stand, mounting bracket, and filter bags sold separately. Single large Acme thread ensures quick opening and tight sealing. Thick and durable polypropylene construction.